Habit: Annual, perennial herb, cespitose, rhizomatous or stoloniferous. Stem: decumbent to erect, 1--7 dm. Leaf: ligule membranous or hairy-tufted; blade generally 10--50 cm, 0.2--1.5 cm wide, flat. Inflorescence: generally digitate; branches 2--30, sometimes in distinct whorls, each raceme- or spike-like branch with 2 rows of overlapping spikelets on 1 side of axis. Spikelet: laterally compressed; glumes unequal, < florets, 1--3-veined; axis breaking above glumes; lower florets fertile, 1--2, upper florets sterile or staminate, 1--4, < 1/2 lower floret length; fertile floret lemma ovate to lanceolate, back glabrous, midvein hairy, 3-veined, awn 1; palea < lemma, translucent, obscure; anthers 3. Fruit: +- fusiform, 3-angled. Habit: Perennial herb. Stem: generally 1--4 dm. Leaf: sheath glabrous; ligule hairy; blade < 15 cm, +- 0.3 cm wide. Inflorescence: digitate; branches in 2--4 whorls, spreading, 5--15 cm. Spikelet: 2--3.5 mm; glumes lanceolate, lower 2--3 mm, upper 2.8--3.5 mm; fertile floret 1, 2--3.5 mm, 1.5--2 mm wide, lanceolate to elliptic, glabrous to hairy, awn 4--9 mm; sterile floret 1, 1--2.5 mm, awn 3--7 mm. Fruit: +- 1.5 mm. Chromosomes: 2n=28,40,63. Citation for this treatment: Rosa Cerros-Tlatilpa 2012, Chloris verticillata, in Jepson Flora Project (eds.) Jepson eFlora, http://ucjeps.berkeley.edu/eflora/eflora_display.php?tid=19273, accessed on April 23, 2019. 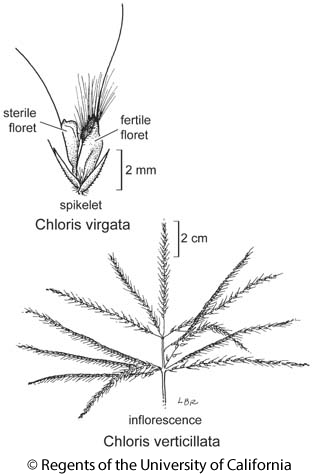 No expert verified images found for Chloris verticillata. n SNF, SnFrB, expected elsewhere; Markers link to CCH specimen records. Yellow markers indicate records that may provide evidence for eFlora range revision or may have georeferencing or identification issues. Purple markers indicate specimens collected from a garden, greenhouse, or other non-wild location.